This ministry team prays with congregants after Sunday service and when otherwise requested, make monthly prayer support calls to members, hold sacred space with prayer requests, and provide in-home and hospital visitation. Members of this ministry team must interview with the minister and attend extensive training. 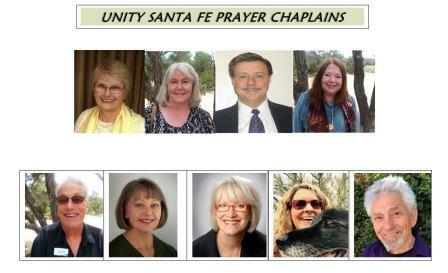 Training will begin with orientations in March and April, 2019 at Unity Santa Fe, a training intensive on May 3rd & 4th, 2019 at Our Lady of Guadalupe Monastery in Pecos, and additional training sessions at USFe. New prayer chaplains will be inducted in June of 2019.